Arizona is Being Overrun by Packs of Vicious Wild Chihuahuas… Vicious? Really? Examiner: Stray chihuahuas are hanging out in miniature packs in various Arizona neighborhoods; chasing and nipping at schoolchildren reports Monday’s abc.news.go. According to the Maricopa County Animal Care and Control, the little ones have been breeding indiscriminately with each other and now have been overrunning residential areas. "Part of it is these animals aren’t spayed or neutered, so they’re out looking for a mate and having babies, which also contributes to the problem," stated a representative from Animal Control. Authorities believe the high number of foreclosures and undocumented workers forced to leave Arizona when the economy crashed, has caused the overpopulation of the small breed. Sadly, chihuahuas are the most popular breed at the Arizona shelters. Chihuahuas are the smallest breed of dogs, and named for the state of Chihuahua in Mexico, although some experts argue that the breed originated in China and were brought over by Spanish traders. The adorable little breed, with varied temperaments and intense loyalties toward their humans, were made popular by Paris Hilton and her famous "chi" named Tinkerbell. Residents are urged to safely corral the little dogs if at all possible, and then call Animal Control. While chihuahuas may not be a popular breed in Maricopa County, many city dwellers in New York City find the adorable little ones perfect for apartment living. As Bob Barker has been repeating for years and years, please spay and neuter your pets. If you are interested in rescuing and adopting a chihuahua? or fostering? Click here for more information. Thi featured Chihuahua featured by the Examiner is named Artie; he is available for adoption. Please refer to ID# 14-02-16-00249, but there are many more. Follow the National Pet Rescue Examiner on Facebook by clicking here. Please visit and "like" my page. You are welcome to submit story ideas by contacting me at cdhanna9703@aol.com. If you possibly can, please help by adopting at least one, by donating for others to adopt and by helping to get them spayed and neutered. 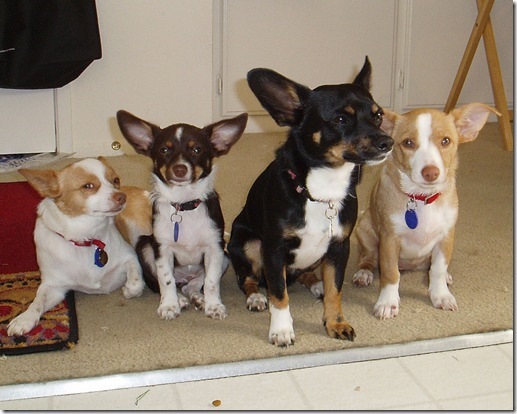 There is always room for just one more pet… just one more Chihuahua, they are small… but be prepared, some are feisty. If everyone that can adopted just one more pet and then acted responsibly, there would be no more homeless pets and no pets euthanized needlessly!! Pros & Cons of Neutering–Really? There are Cons? Yes, actually, there are and that may surprise you. It did me. After all, we’ve heard from animal welfare advocates for years preaching the gospel of spay/neuter. Heck, I preached this myself and for the majority of dogs and cats (ESPECIALLY cats! ), “the big fix” is the best thing that ever happens to them. 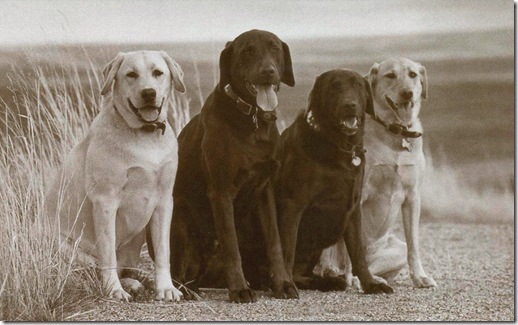 There’s new evidence, though, that for dogs at least the pros and cons are not so black and white. While the University of Georgia’s sample of 40,139 canine death records from the Veterinary Medical Database from 1984-2004 concluded that neutered dogs could be expected to live a year and a half longer (on average) than intact dogs, other studies point out potential increases in hip dysplasia or cancer. Oy. So what’s a responsible pet parent to do? One possible solution is a new non-surgical sterilization technique called Zeuterin from Ark Sciences, that renders the boy dogs incapable of fathering puppies but let’s them keep about 50 percent of their testosterone that makes a beneficial health difference especially in certain breeds. Amy is so right, spay/neutering is not a cut and dry proposition… no pun intended! JOMP! Adopt Just One More Pet and Save a Life!! – Sharing a Great Pet Adoption Pet Story!! One of the many dark tales coming out of Sochi is the revelation that Russian authorities have been executing stray dogs. US Olympic skier Gus Kenworthy plans to do something about it by saving them. Obviously, people were outraged when they heard about the killings. Oleg Deripaska, one of the wealthiest men in Russia, was so upset by this that he took it upon himself to save as many as he could. He used his fortune to build shelters for the strays in Baranovka, which is near Sochi. Kenworthy expected to be on his way home with the pups by now but has been delayed by paperwork problems in Russia?!? Some of the the dogs are being adopted by Olympics fans and heading to new homes. According to ABC News on Tuesday the process of American fans adopting a dog is being helped by the Humane Society International. Outlining all the requirements for moving a dog from one country to another, it seems that finding a local Russian vet is the fastest way to get help in seeing if Fido can come home. Getting all the shots necessary for the pup to leave the country is the first step. Plus a kennel needs to be acquired for the flight of an animal if they are going to be shipped on an airplane. The process of owning a Russian dog might be costly with just the airplane ride being $150 for the canine’s travels to their new home. Russian billionaire Oleg Deripaska stepped in before the Olympics and opened a mountain refuge for some dogs to hang out, but the issue still isn’t resolved. Fans worry that after the athletes leave the dogs could be left out to roam again or worse. Offering up assistance to help adopt dogs seems like a logical solution at the moment and if fans are willing to take a new four legged friend home, it might be the perfect answer to helping some of the dogs. Gannett Michigan: Logan’s Law, a package of four bills designed to fight animal abuse passed through the Michigan House of Representatives Judiciary Committee on Thursday. “We are pretty excited about the bills being passed through the committee,” said Rep. Paul Muxlow, R-Brown City. Muxlow sponsored House Bill 4534 of Logan’s Law. The bill stipulates that before someone can adopt a shelter animal, the shelter must use the Internet Criminal History Access Tool, which is a Michigan State Police database, to search for a history of child and spousal abuse and other violence. The other bills include language that non-profits do not have to pay to access ICHAT; state police will prepare an annual report of animal abuse offenses; and convicted abusers cannot adopt an animal for five years after their time has been served. The annual report will serve as a registry of animal abusers. “This is a very big victory for Logan’s Law and for all of the animals in Michigan,” said Matt Falk, owner of Logan, a Siberian husky for whom the law was named. In 2012, someone splashed Logan, who was in his outside kennel, with acid, Falk said. Falk said that it took four to five days to neutralize the acid. The bills will now move to the Michigan Senate floor for a vote, then back to the House floor for a full vote before going to the governor to sign into law. Falk, along with House and Senate members, have work on passing the law for two years. Falk said he wants to protect other animals from what his dog suffered. Four months after the attack, Logan died. If the bills pass, Michigan will be the first state to enact an animal abuse registry. Pit Bull type breeds are included in every single breed restriction or ban that has been set in place by each region that has implemented a legislation, every single one! This ban affects dogs all around the world. These bans and restrictions around the world vary from region to region but the effect that it’s having on these dogs is very real. 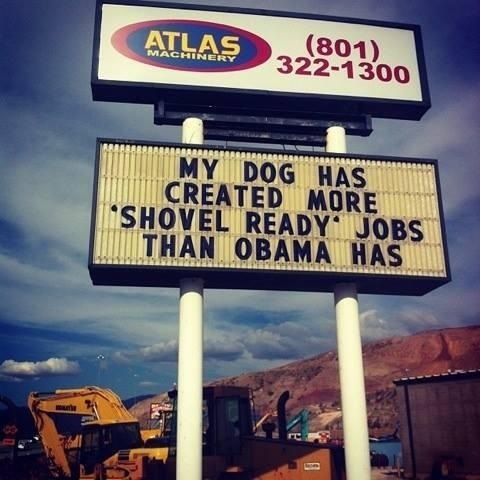 Post “Beware of Dog” signs around your residence. Everyday, Pit Bulls are being killed due to legislation. In the areas where these dogs are illegal to have, there are many people that have no choice but to relocate their dogs within a certain time frame or give them up where they eventually are killed. Since it is already hard as it is to relocate Pit Bulls, the rise in deaths has grown drastically. These are dogs that have never harmed a thing in their lives and are gentle and loving and are being forced out of their homes to suffer an unjustifiable death with no where to go but shelters where they are put down. It’s a Holocaust of sorts and is completely unfair to loving dogs and owners alike, who both feel the impact. The fight to end BSL is one that will take the efforts of every person that cares about these dogs. If we don’t stand up for them no one will and then what? Let them die, suffer, and soon be banned everywhere causing the extinction of many breeds? Ending BSL starts with you. Educating yourself and others and being a responsible dog owner is just the beginning to a long road of changing the view about Pit Bulls and Pit Bull type breed. Digital Journal: Success of coalition approach to ending the killing of healthy animals in shelters provides road map for cities across the nation. The number of healthy or treatable dogs and cats killed in Los Angeles city animal shelters has been cut nearly in half in just two years, Best Friends Animal Society announced today. Statistics provided by LA Animal Services show that since the formation in 2012 of a 70-organization coalition led by Best Friends Animal Society, shelter deaths have dropped 48 percent. In 2011, the year before Best Friends launched its NKLA (No-Kill Los Angeles) initiative with the City of Los Angeles, approximately 17,400 healthy, treatable dogs and cats were killed in LA shelters. One year later, the number was reduced to approximately 13,400. In 2013, the number decreased further to 9,075. Best Friends’ NKLA initiative, which is built around a partnership with the City of Los Angeles, began in January of 2012, with the goal of ending the killing of healthy and treatable pets in LA shelters by 2017. The approach provides economically targeted spay/neuter services so fewer animals enter shelters, as well as adoption incentives and promotions to ensure that more animals exit the shelters alive. Brenda Barnette, general manager of LA Animal Services, says the partnership and resulting coalition has paid big dividends. The number of animals killed each year in shelters around the country is around four million -approximately 9,000 every day. Best Friends, which has introduced “Save Them All” as its national call-to-action, is working with no-kill advocates across the country to bring that number down to zero. Several key factors make these kinds of strides possible in a city the size of Los Angeles. Best Friends regards Los Angeles as both a trendsetter and a representative proving ground, suggesting that this type of program can be replicated in other cities around the country. The coalition focuses on two key areas – promoting adoption as the best way for Los Angeles residents to get their pets, and making it much easier for low-income pet owners to have their pets spayed or neutered through the delivery of free or low-cost services into communities with little or no access to veterinary care. Best Friends operates two dedicated facilities to increase adoptions of city shelter animals. The Best Friends Pet Adoption and Spay/Neuter Center in Mission Hills is run out of a city-owned facility and only offers for adoption shelter dogs and cats from any of the six Los Angeles shelters. The NKLA Pet Adoption Center in West Los Angeles, operated by Best Friends through a foundation grant, features homeless LA pets for adoption from a variety of coalition partners. Total adoptions from both centers numbered approximately 3,800 dogs and cats in 2013. The Mission Hills center clinic performed more than 6,200 spay/neuter surgeries, over 3,000 of which were reserved for pets of low-income families. Best Friends also employs special pet transports to save LA shelter animals. During the past two years several thousand LA Animal Services dogs and cats were delivered to guaranteed adoption rescue partners across the country, while more than 1,700 neonatal kittens and dozens of nursing mothers were saved though an on-site kitten nursery in Mission Hills. Additionally, the lives of hundreds of neonatal puppies and several nursing mothers were saved through a foster network. Battista says that while Best Friends and its partners are on track to meet the goal of taking the city to no-kill by 2017, there are no plans to take the collective foot off the pedal. Best Friends Animal Society is the only national animal welfare organization focused exclusively on ending the killing of dogs and cats in America’s shelters. An authority and leader in the no-kill movement since its founding in 1984, Best Friends runs the nation’s largest no-kill sanctuary for companion animals, as well as life-saving programs in partnership with rescue groups and shelters across the country. Since its founding, Best Friends has helped reduce the number of animals killed in shelters from 17 million per year to about 4 million. Best Friends has the knowledge, technical expertise and on-the-ground network to end the killing and Save Them All®. One of the few topics of agreement between liberals and conservatives I’ve found is pets, particularly the problems caused by over population. The cool thing is that when the topic of whether Obama should be impeached or not comes up, and your liberal friend’s head is about to explode, just send him a picture of a cute dog needing rescue. Immediately all will be forgotten and instead of pistols-at-dawn (or since we’re talking leftists who support gun control, re-education camps or at the very least, IRS audits) you’ll be sharing animal rescue stories and plotting how to change attitudes towards spay and neuter programs. Look we all know Obama is the worst president in history, but whomever takes his place will likely not be able to solve the problem of pet overpopulation. To do this requires not just changing the attitudes of those who believe it’s “unnatural” to spay or neuter a dog or keep their cat inside, it requires changing our attitudes as well. I used to consider myself a cat person. When I was five I ended up with a tiny little kitten, the runt of the litter who wouldn’t be nursed by her mother. So my mother gave me a doll bottle with kitten formula and I nursed the kitten myself. The kitten became my first best friend. I wrote songs and poetry to her while a child and she repaid me with her company for 17 years. There have been other cats since her passing, but none like her, and because of my experience with her I shunned dogs for the most part until my son came into the picture. We ended up adopting a Bichon, and it rekindled my interest in dogs. I realized something: I wasn’t a cat person at all. I was an animal person. I found the love I had for animals wasn’t limited to a specific species or breed, it transcended such divisions. As I grew older I met others who felt the same. Some had lived with a special dog that changed theirs lives. I’ve even met people who had a special rabbit and parakeet. There are no dog or cat people at all. There are just animal people. And it makes sense. We are after all animals. We are products of Nature and have evolved and developed as a species alongside other animals. We have influenced their evolution and they ours. Dogs. Cats. Horses. Cows. The history of all domesticated animals are intertwined with ours as a species, and so it should not come as a surprise that today in the modern era there are people like us who still treasure the company and care of animals. But not everyone agrees. I’ve lived in places where animals were viewed no differently from inanimate objects – property to be used and discarded at will. One way those of us who chant the mantra of “spay and neuter” can further help the pet overpopulation problem is by adopting more animals. 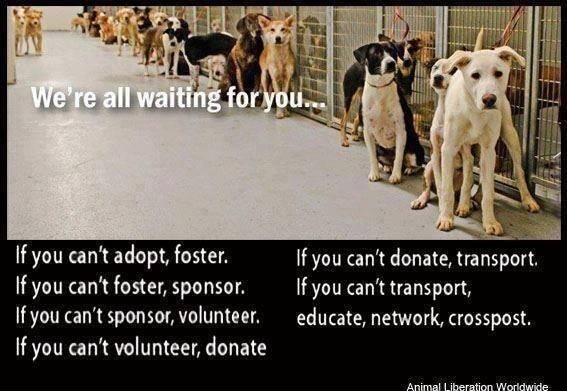 If you have one dog, add another from a shelter. If you have two dogs consider adding a cat – preferably two – to your home. Most domestic animals prefer the company of others of their kind, and that is true with all the animals I’ve handled whether tropical fish, cats or horses. You don’t have to go crazy. I don’t want anyone appearing on Animal Cops. Adopting animals is easy; caring for them on a day-to-day basis is another. I’m running two litter boxes for 8 cats and have to scoop them daily. If I don’t disaster strikes, and honestly it is a chore along with all the other animal chores I have for caring for 8 dogs, 13 chickens and 45 gallons of tropical fish that make daily life a challenge. The idea is to save as many animals as you can properly care for, and that requires having the means to pay vet bills ($4,000 one year not too long ago), the time to exercise your dogs and lavish attention on each and every one of your pets. Making room in our hearts and homes while proselytizing about the importance of spay and neuter programs, the immorality of breeding for profit, and donating time and money to your favorite rescue group or animal shelter will speed the arrival of a time where every animal is wanted and has a forever home as each deserves. If you have enough love in your heart, there is always enough room in your home to adopt just one more pet!! And we are not talking hoarding!! But the idea that homeowner’s associations and even city rules have been put forth that declare that 1,2 or 3 are all the pets someone can have is ridiculous. Everyone is different and each situation is different. Just as for some people having ‘no human children’ is the best choice, for others 1 or 2 is plenty and for still others 5, 6, a dozen or even more is perfect… so it is with fur, feathered or scaled kids. It is all about love and being willing to take responsibility for another life (lives)… not about a number! Bleacher Report: Budweiser is one brand that has become a Super Bowl staple over the years. One thing it has done perhaps better than any other advertiser over the years is create associations with animals, most notably Clydesdales, and the product. The latest example of its effectiveness comes with a commercial titled "Puppy Love." It showcases a young dog that creates a bond with the famous horses, and any time he’s taken away, he figures out how to get back with his much larger friends. 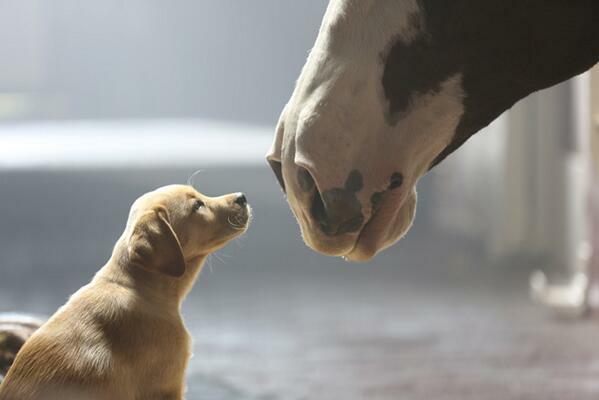 It’s another commercial in a long line of successful Super Bowl spots for Budweiser. Being able to tell an interesting story that anybody can understand in one minute or less is something that’s very much easier said than done, but the brand has made a habit of delivering memorable ads. That connection between the Clydesdales and Bud is essential and makes for an outstanding marketing tool. It allows the commercial to focus on the story without having to spend a bunch of time showcasing the product itself. Instead, when the Clydesdales pop up on the screen there’s instant knowledge that it’s a Budweiser commercial. There doesn’t need to be a ton of product placement, celebrities talking about it or anything else of that nature. It’s an automatic link. The "Puppy Love" spot was actually released ahead of the big game, which is a growing trend as companies attempt to have their commercials go viral. It was an immediate hit, with Adweek calling it the "first truly great" spot of the Super Bowl batch. Budweiser deserves a lot of credit for coming up with good ideas for the Super Bowl on a yearly basis. Advertising during the event is costly and that means there’s little margin for error, but the brand rarely swings and misses with its spots.